The VECTASTAIN® Elite ® ABC complex is smaller and more uniform than conventional avidin-biotin complexes. They have greater accessibility to biotinylated targets within tissue samples. VECTASTAIN® Elite ® ABC Kits are our most sensitive avidin-biotin based peroxidase systems. Available in ready-to-use formats that yield the same high sensitivity and low background as the corresponding conventional VECTASTAIN® ABC Kit reagents. Our original avidin-biotin ABC complex formulation. With VECTASTAIN® Universal Quick Kits, you can quickly detect primary antibodies made in mouse, rabbit, or goat. These kits rely on a proprietary preformed peroxidasestreptavidin complex to achieve outstanding sensitivity with short incubation times. 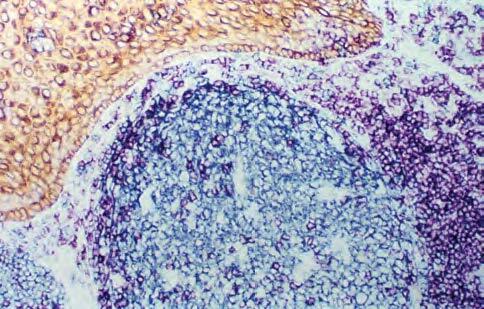 Rapid protocol: Staining in less than 20 minutes following primary antibody incubation. Working solutions can be used immediately after dilution.